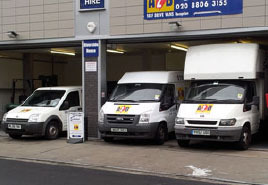 We are one of the cheapest van hire companies in the Hackney, East London area. We are a family run business and have been hiring vans to regular customers for over 16 years. Our Clapton office is located at the premises of Make Space Self Storage, Leaside Road, Just off Upper Clapton High Street, where we have a wide range of vans ready for rental to you or your business. We offer very low rates that include insurance, roadside assistance, VAT and unlimited mileage. Our vans are well maintained and regularly serviced ensuring a stress free reliable van hire service. We offer discounted weekly rates, so if you need a cheaper solution for getting from A2B, you can place a booking request online or simply call us on 020 8806 3155 and one of our friendly team can reserve your van and make sure you have all the information you need. We are easy to find by car (just off the A107) and just a short walk from Clapton train station. The 393 bus stops 100 meters from us on the corner of Leaside Road and Theydon Road and the 254 and 253 stop near by. Our central location and low prices makes us an ideal choice for people needing van hire in the E5 area, Upper Clapton, Clapton, Homerton, Hackney, Stoke Newington, Stamford Hill, Tottenham, Leyton, Walthamstow, and beyond. To find us, please use the map link opposite or find directions below. Head north bound on A107, At the Leabridge Roundabout, take the 2nd exit onto Upper Clapton Road. Immediately after Clapton train station, turn right onto Southwold Road. Turn 1st left onto Theydon Road and follow around until you reach Make Space Self Storage. Head south on the A10 / High Road, take a slight left onto Clapton Common / A107 for 0.8 miles. Turn left onto Warwick Grove and continue onto Leaside Road until you reach Make Space Self Storage. Head north on Stoke Newington High Street / A10 towards Sanford Lane, Turn right onto Cazenove Road. After 0.6 miles, turn right onto Upper Clapton Road, then immediately left onto Warwick Grove. Continue onto Leaside Road and follow around until you reach Make Space Self Storage.